A blog post by Museum Volunteer Robyn Hughes, MA. As a docent at the JMM, I not only get to give tours to the public, but I also have the opportunity to work on a wide array of programs and projects. My most recent project was the production of a twin vision book. 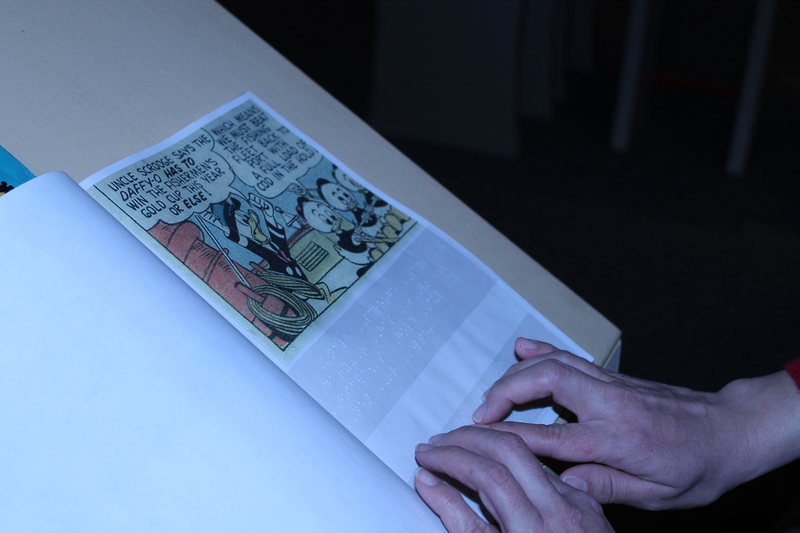 A twin vision book is a book with braille text, print text and print illustrations. The idea to create this book first entered my mind when I saw the print books in the reading nook in our new exhibit ZAP! POW! BAM! 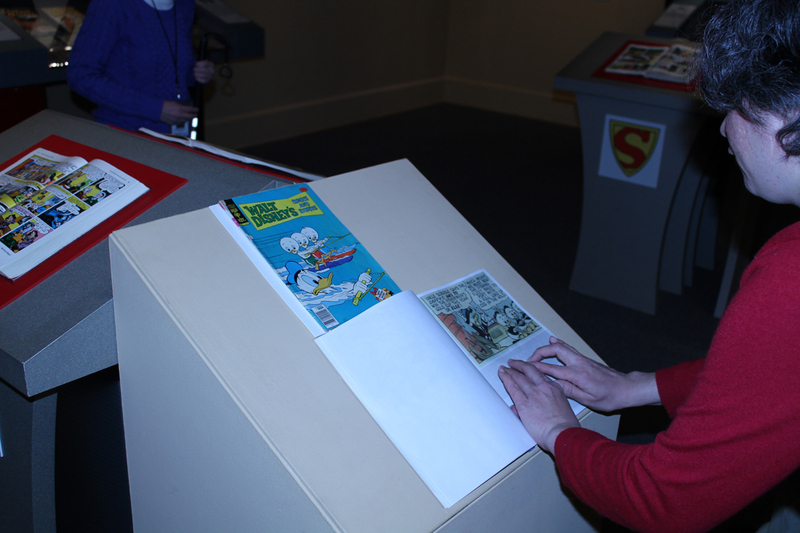 The Superhero: The Golden Age of Comic Books, 1938 – 1950, during Docent training prior to the exhibit opening. I shared my idea with my colleagues and they were as excited about the project as I was! We were motivated to bring to fruition at the JMM the aspiration “That All May Read,” a quote that I had seen years before on the National Library Service for the Blind and Physically Handicapped’s web page and have always been moved by. If you are curious about the number of potential Museum guests who could benefit from having access to a book in this format, some medical researchers have estimated that at least five million Americans have a severe visual impairment or blindness. The production of the book was truly a team effort. 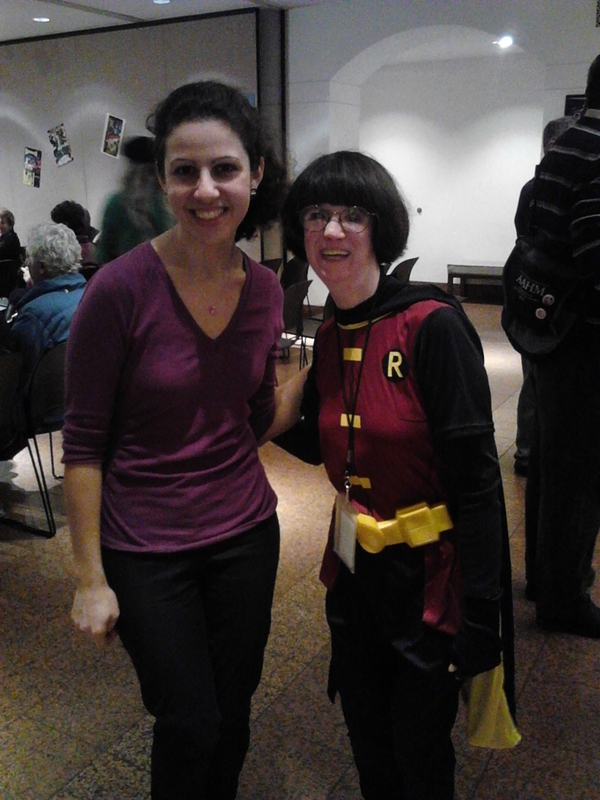 First, my supervisor Ilene Dackman-Alon, the Director of Education at the JMM, searched for a story in a classic comic book for us to translate. She selected the Madcap Mariner by Walt Disney Comics. Ilene then transcribed the print text into a Word file and emailed it to me. I used braille translation software to translate it and to print it on my braille printer. The translation and printing process is not as laborious as one may think, thanks to braille translation software. It actually only takes five mouse clicks to complete. I proof read the translated text to check for translation errors, but the braille translation software programs are so accurate these days that mistakes in straightforward text documents are uncommon. After the braille text was completed, my mother Norma Service, with assistance from her husband Bill photocopied the print text and illustrations in a large font size, so that the book would be accessible to as many visitors as possible. We then assembled the book. The most time consuming part of the project for my mother and me was trying to get the braille text to correspond with the print text on each page, because braille is approximately twice the size of print. After much work that included some reformatting of the braille text, we were successful. We had created the first publicly available twin vision book adaptation of a story from a classic comic book in the United States (at least as far as we know)! The original print version of the story is 4 pages long with 487 words; in contrast the twin vision book with the same number of words is 29 pages long. Now that we had a book, we needed to let the world (or at least our part of it) know about it. That was when the real fun began! I started looking on the major national low vision organizations’ online calendars for programs that would tie-in-with both our book and our exhibit. I was amazed at our good fortune, I saw that the National Federation of the Blind was planning their own celebration of Read Across America Day (a nationwide commemoration of Dr. Seuss’s birthday), which was (at that time) just a week away on March 2nd. I contacted Melissa Riccobono, the President of the National Federation of the Blind of Maryland to invite her to help us at the JMM celebrate the Day. She accepted our invitation and came and read The Madcap Mariner in the Feldman Gallery to much applause. Please come be a part of this continuing Tale of The Twin Vision Book and explore the world of the classic comic book at the JMM! The exhibit will be at the Museum until August 18th, 2013. Tagged:	braille , comics , Madcap Mariner , Read Across America , Robyn Hughes , texts , translations , volunteers , Walt Disney , Zap! Pow! Bam!